Cheer on the dance presentations, musical highlights, and the adorable parade of dogs at the free weekend-long festival. Performers from West Coast Ballet dance the can-can at a past Santa Barbara French Festival. Join the joyful weekend at Oak Park on July 15 and 16, 2017. SANTA BARBARA FRENCH FESTIVAL... will be celebrating la vie de France via a number of buoyant activities. The dates are Saturday, July 15 and Sunday, July 16, the location is Oak Park, and organizers are spreading the word that the area wildfires will not impact the 2017 festival going forward. So stop by to lend some love to Santa Barbara and savor a delightful day of dance, of classic French eats (think pastries, crepes, and more), and the French Conversation Booth, if you want to hone your skills. Oh, and the cute Canine Cavalcade, which, long ago, centered on Poodle cuteness but now encompasses chiens from every corner of dogdom, will take place on both Saturday and Sunday at 6 in the evening (a cooler time for pups in costumes). And is that a gentleman wearing a Napoleon outfit carrying a French bulldog at the parade's lead? Why ouí, it is (that's Jellie Beanz in his arms, by the by, the dignified mascot of the merry affair). 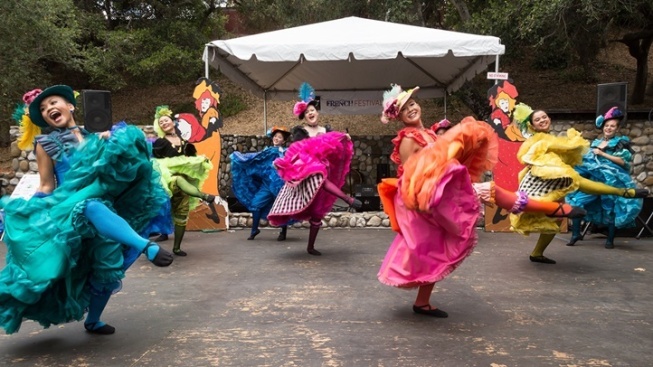 For a sense of the Seine-close life, be in Santa Barbara, on July 15 and 16, with crepes, can-can, and Jellie Beanz will all spread some beaucoup charme.